Roof RocketThe Department of Labor reported that there were 299 deaths caused by workers falling off of roofs from 2003 to 2010. Many of these deaths could have been prevented if proper safety precautions had been taken. Our Boston work injury attorneys know that employers are required to comply with OSHA rules on fall protection when roofing work is performed. 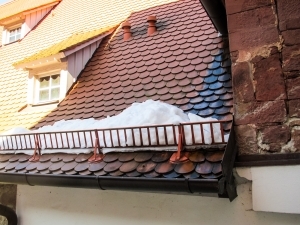 It is important that employers know of the rules for keeping workers safe while roofing, especially as the weather warms up and more people hire professionals to tackle outdoor projects such as putting on a new roof. Employers have the obligation to ensure that their workers are not put into jeopardy when they are doing a job. When the job the worker happens to be doing is up high on a roof, then employers must make absolutely sure that they do everything possible to prevent a devastating or deadly fall. Federal rules make clear that proper safety precautions should be taken any time construction activities are performed that require a worker to be more than six feet up off the ground. Roofing, of course, is an activity that mandates workers are higher up than this. As such, the fall protection requirements for roofers include protection through a safety net system; guardrail system or a personal fall arrest system. Employers must comply with OSHA requirements and all federal rules or they risk not only having to pay workers’ compensation claims but also facing OSHA citations and fines. The roofer wearing a safety harness at all times. The roofer wearing a hard hat. The use of caution tape around a building alerting people to the fact that there are roofers on the roof. Ensuring that the ladder rises at least two feet above the rooftop in order to ensure that the ladder is sturdy. Carrying tools up to the roof not using your hands but instead using a tool belt for smaller tools and a pulley system for larger ones. Checking all safety gear before starting the job. It is important to ensure that it is in good condition and that it is not breaking, broken, frayed, torn or scratched. Workplace Safety Experts also addresses other safety tips to protect roofers from non-fall injuries that could occur on the roof. For example, workers should point their air knife away from the body when cutting shingles to avoid cutting themselves; should consider wearing knee-pads to protect their knees while on the roof; and should wear work glove to protect their hands from shards from wood and shingles. While fall accidents tend to get the most attention when it comes to roofing accidents, these issues are important to keeping a worker safe as well. If you or a loved one was involved in a work accident in Massachusetts, call the Law Offices of Jeffrey S. Glassman for a free and confidential appointment — 1-888-367-2900. Our Infrastructure is Aging & Construction Workers are at Risk, Boston Personal Injury Attorney Blog, January 14, 2013. Raising Awareness of Fall Accidents in Boston and Elsewhere, Boston Personal Injury Attorney Blog, June 21, 2011.